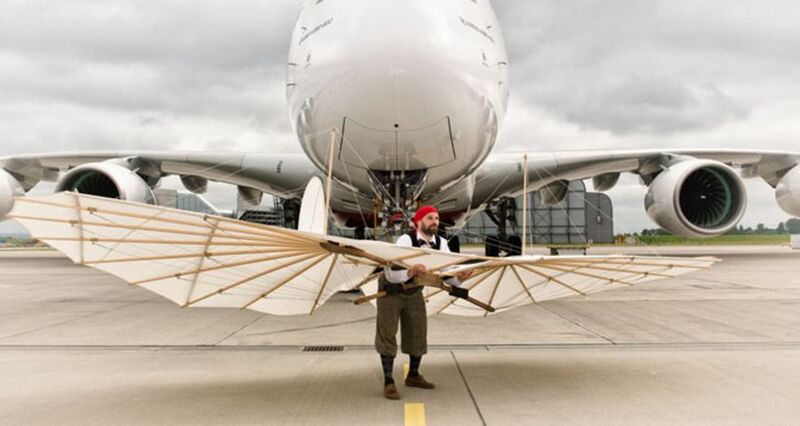 "You can sense that the glider is really alive"
With a reproduction of Otto Lilienthal’s soaring apparatus, research scientists at the DLR have been able to scientifically reconstruct the cause of the crash during his final flight. Lilienthal double Christian Schnepf talks about the tests and about how his respect for the aviation pioneer’s accomplishments has consistently grown. In a research project, research scientists under the leadership of Andreas Dillmann from the DLR-Institute of Aerodynamics and Flow Technology in Göttingen reconstructed the glider in order to uncover the secret as to why, on 9 August 1896, after many previously successful trial flights, Lilienthal crashed. With the aid of the Lilienthal Museum in Anklam, they recreated the flying machine on the basis of historic documents and photos. Even the covering of an original wing was analysed by materials researchers, in order to weave the material as close to the original as possible. One of the highlights of the scientific experiment was a measurement in the German-Netherlands LLF wind tunnel. With key-point measurements, the aerodynamics experts ascertained how well, by merely shifting the weight of the human body, the flying machine could be steered. DLR researcher Christian Schnepf served as Lilienthal double by hanging from the roughly 10,000 euro replica during the series of tests. Schnepf had to persevere in a rigid body position and with alternately prostrate or bent legs, in order to generate usable values for the measurement. “I had extremely sore muscles the next day. It was always difficult to get up in the morning the day after,” he remembers. It was an entirely new research experience for this scientist, who had otherwise been involved with simulations on his computer. “I could feel that I had been physically exerting myself.” Schnepf and his colleagues were in considerable awe of the costly replica. “It made me nervous because it’s obviously a bit of history that I was hanging inside of,” enthuses the researcher. “One can only have respect for this construction, for this masterpiece, that Lilienthal built.” Only intermittently, however, did Schnepf have aspirations of actually climbing into the flying machine and giving it a go. Lilienthal himself died in a crash in late summer 1896, during his final flight test. As the research scientist’s measurements of the reproduction have now shown, it was not caused by mechanical error; rather, it was pilot error. He should not have attempted that flight test – the last of more than 1,000 attempts – under those particular weather conditions, says Andreas Dillmann. His glider was constructed only for still air or headwinds. The wind conditions on the day of his crash had been improperly estimated by Lilienthal. He flew into a ‘thermal updraft’ – heated air on the ground that is borne away and rises up in a bubble. This pulled the nose of the glider quickly upwards, initiating a stall. Given his limited possibilities for steering, Lilienthal was no longer able to get the glider under control. “Basically, Lilienthal did react appropriately,” said Dillmann, once the test results were released. “We know from witness testimony that he thrust his legs and upper body forward.” Nevertheless, Lilienthal crashed, succumbing to his injuries one day later, on 10 August 1896. Regardless, Christian Schnepf also admits that occasionally the temptation overcame him to actually try out the apparatus. At least, he quips, that’s during those times when he wasn’t reminded – due to the sore muscles – of how unpleasant the after-effects can be. But whether or not he would, in the end, actually run down a hill in order to lift off, he cannot say for sure – especially in view of the ultimate fate of the experienced flyer and engineer.